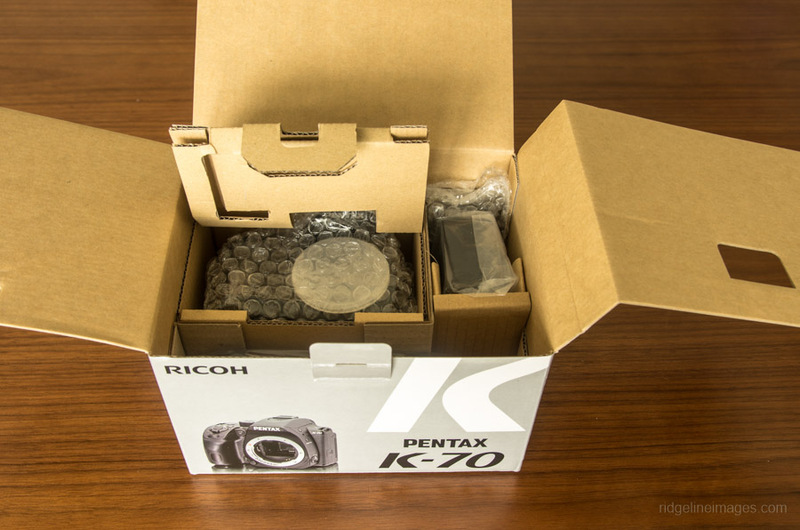 Since its announcement in early June the release of the Pentax K-70 has been eagerly awaited. This was especially true for someone still cradling a near on six-year-old K-5. The K-70 is a midrange DSLR that succeeds the K-50 which came out in mid-2013. As a cost performance option for many shooters its market segmentation should fill the gap nicely below the roundly praised full frame K-1 and enthusiast grade K-3 II. As someone who regularly spends extended periods outdoors, often in environments not overly befitting to kind handling, a rugged, well-built body was a must. The K-70 boasts an impressive 100 weather seals which should serve it well when the going gets rough. In a similar vein to the K-3 II, the K-70 also operates responsively in cold weather at temperatures down to -10°C (14°F). At release today Ricoh is offering the K-70 in two color options including silver or in a traditional black finish. 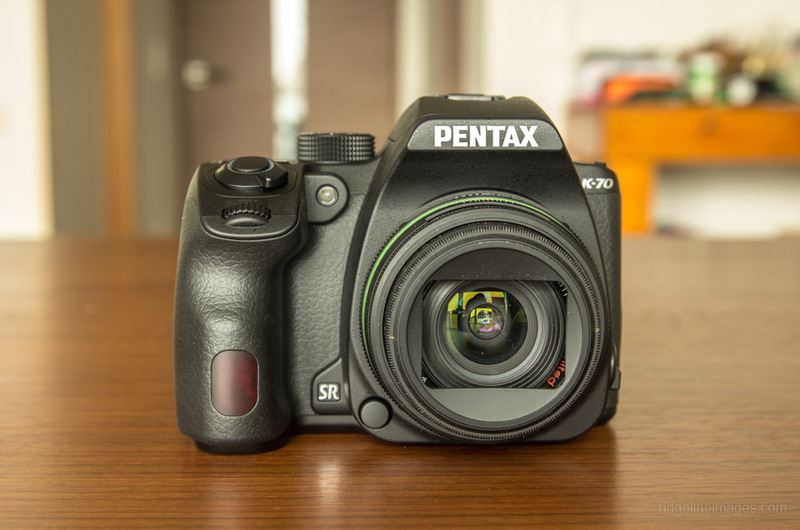 Let’s take a look at why this camera is making some ripples in the Pentaxian world. 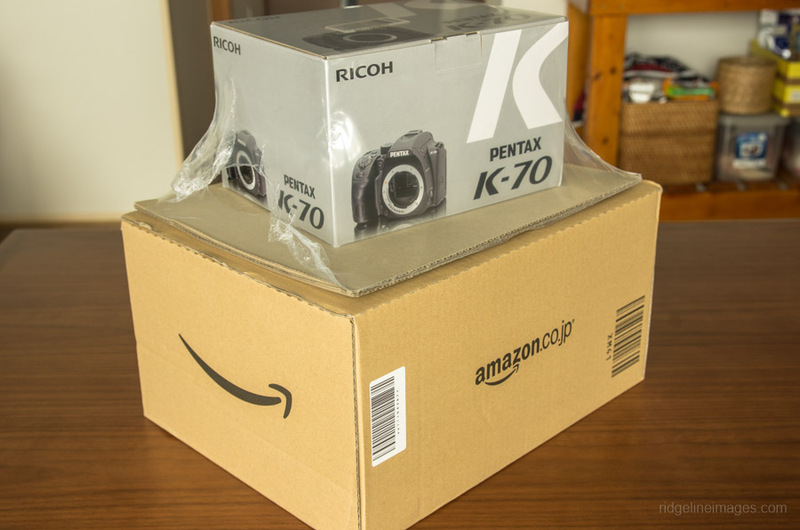 Newly delivered Pentax K-70 ready to be opened. Everything meticulous packed as you would expect. Rundown of some of the K-70’s finer features. Unlike the K3-II the K-70 only comes with the first iteration of the ultrasonic vibration dust removal. The Shake Reduction function allows for up to 4.5 stops compensation and a new accelerator unit augments the PRIME MII imaging engine with improved IQ at all sensitivity levels which top out at ISO 102,400. The custom image has 13 selectable image finishing tones. The K-70 also beefs up the effective pixel count to approx. 24.2 megapixels from a lowly 16.3 on the K-50. Trickling down to midrange sphere is the ability to capture super high resolution images through the Pixel Shift Resolution function. Pentax K-70 camera body and accessories. The Japanese release includes the following accessories: a rechargeable lithium-ion battery D-LI109; battery charger D-BC109; AC plug cord; standard Pentax strap O-ST132 and SILKYPIX Digital Camera Utility 5. Unfortunately Ricoh only includes the ‘Start Guide’ rather than the unabridged K-70 operation manual. Rechargeable D-LI109 lithium-ion battery and D-BC109 battery charger. For owners upgrading from a K-50 the good news is Ricoh has mercifully stuck with the same battery and charger. 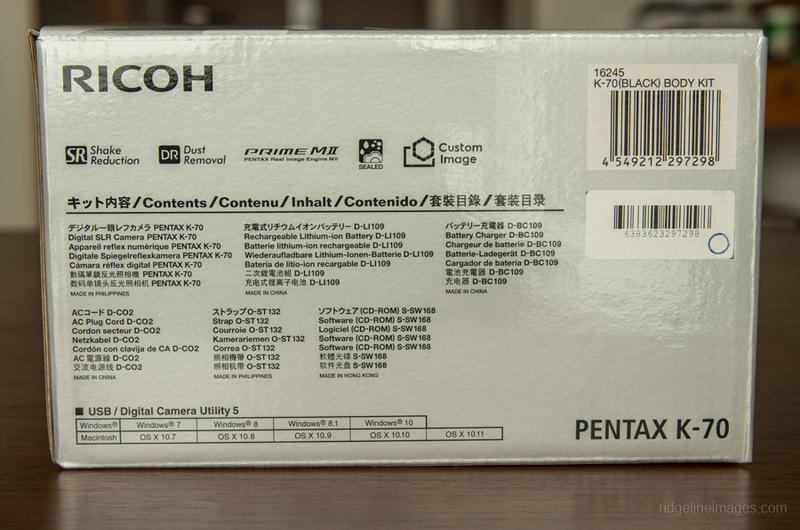 Pentax K-70 with a PENTAX DA 21mm F3.2 Limited lens. Out of the box the camera exhibits a slightly boxy construction. In comparison to the K-5 it has a more compact design and importantly feels nice to grip. Weight wise the K-70 comes in fractionally heavier than the K-50 with the battery and memory card installed. The front and rear e-dial controls are non-rubberised and a little fiddly. The main power rotates smoothly and the buttons have a sufficient amount of travel. The shutter is also somewhat louder than expected. Connectivity wise the camera comprises a HDMI terminal (type D) and USB terminal (micro B) on the right side. On the opposite side finds a stereo microphone and cable release terminal. The camera accepts SD, SDHC and SDXC memory cards (USH-I compatible). 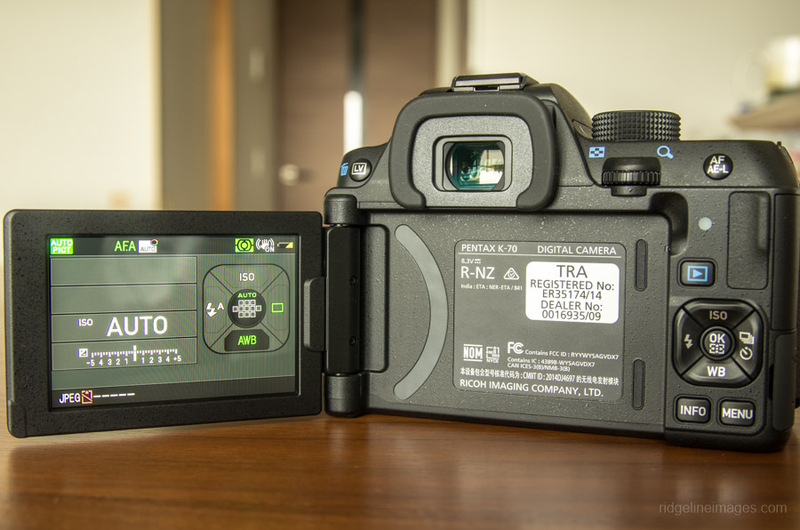 The camera also retains a built in flash rather than integrated GPS like the K-3 II. Back plate and button positioning. Compared with K-50 the modes and dials are little changed barring the AF AE-L button being sensibly repositioned next to the rear e-dial. The buttons are also now larger and work better ergonomically. There is also a thoughtful rubberised ‘thumb rest’ which makes handling the camera more comfortable. The top plate of the K-70 enjoys some new enhancements. The top panel also gets a bit of a revamp with the mode dial getting an additional user preset. The movie mode has disappeared from the top mode dial and is now located on the main switch. More as a cosmetic enhancement, the main switch lights in green when turned on and red when it enters movie mode. As a nod to operating the camera in challenging conditions the mode dial has been refashioned and is now taller allowing it to be more easily adjusted wearing gloves. Finally, the incorporation of built-in Wi-Fi is a welcome addition for easy social network sharing or email. The K-70 sports a vari-angle LCD. In contrast to its predecessors the camera now sports a vari-angle LCD that can swivel and twist for high and low-angle shooting. A new inclusion is a red-lighted monitor display function to assist in night vision. Similarly, an outdoor view setting helps reduce the LCD ‘washing out’ during daytime use.